What is the Chamber Music Institute? The CMI is an intensive classical music camp focusing on chamber music performance. Students are assigned to work with a trio, quartet, or quintet throughout the week. Each group meets twice daily for coaching sessions with CMI artist faculty. The week culminates in a public concert featuring student ensembles. Guest artist ensembles are featured in performance during the session. Concerts by CMI faculty, special presentations, reading sessions, workshops and a variety of fun activities the week at the CMI. Rehearse and perform under the guidance of artists and performers renowned for their experience in playing and teaching chamber music. Experience a master class with special guest artists. Choose elective course offerings designed to improve musicianship and musical knowledge such as composition, choral music, music technology, and mandolin ensemble (electives are subject to change year-to-year). Enjoy evening recitals by professional chamber ensembles and recreational/social activities. Perform in an end-of-session Student Gala Concert held at the Nicholas Music Center. Experience a preview of living on the campus of a major state university. Reside in university housing or commute to campus. What is the age range of CMI participants? Students ages 12-18 (students entering 7th to 12th grades) who play a bowed string instrument, guitar, piano, brass, or woodwind instruments may apply. We are flexible concerning age range, occasionally accepting slightly younger or older students who, based on ability, would benefit from participation in the camp. The average age of camp participants varies from year-to-year. Generally, age distribution is even across the range, not overemphasizing participation of older or of younger students. How many students typically participate in this camp? Approximately 45 students participate in this camp. We strive to maintain a low student-to-faculty ratio, which allows us to offer students plenty of individualized instruction. Where do most students attending the camp come from? Most students come from the New Jersey and greater New York area. What is the performance level of CMI participants? CMI prides itself in accommodating a wide range of abilities. We have been fortunate to attract many high-level student performers to CMI. The most advanced of these students attend competitive pre-college programs in NYC and here at the Extension Division. Many are members of premier youth orchestras as well as regular participants in instrumental competitions. Students at earlier stages of advancement and training are also welcome! The CMI also attracts CMI is also an excellent “first experience” for students who are new to summer music camps, who desire a fun, but a productive learning environment. The significant number of students across age and skill level allows us to appropriately place students in ensembles with similarly matched colleagues. By doing this, we are able to create an environment in which students are supportive of one another’s efforts and in which one can be successful at any level of advancement. Is a list of faculty available? Past faculty members are currently listed on our website. Most will return year after year. We anticipate announcing final faculty appointments for this summer in March. What events are open to parent observation? The end-of-session chamber ensemble concerts on the final Friday evening in the Nicholas Music Center is open to friends, family, and the general public free of charge. Can parents/family observe instruction during the CMI? Non-camp participants are not allowed to be present during instructional or other non-public events. Safety considerations mandate that the Extension Division keep strict boundaries between the public and campus events involving the instruction of minors, even if the adult attending is a parent of a student. May parents attend the opening orientation for CMI students? No. This orientation is for the students alone and begins a process of building community within the camp focusing on matters of student, faculty, and staff interaction. Where are camp activities held? All camp activities are held on the Douglass Campus of Rutgers University. Nicholas Music Center and Marryott Music Building are where a majority of camp activities are held. Will my child be safe on campus? Yes. We take great care to supervise buildings, surrounding areas, and all activities utilizing Extension Division staff and counselors. Are college classes in session during the CMI? Yes. Camp participants and collegiate students may pass by one another occasionally. However, our camp events are distinct from all collegiate activity. The interaction between Rutgers student population and our camp guests is extremely minimal. Are dormitories nearby the instructional facilities? Dormitories are a 10-minute walk from the Nicholas Music Center, where most CMI activities are held. The Neilson Dining Hall is midway along the walking path between dormitories and the Nicholas Music Center. Residential students need only walk to/from the dormitories once daily (morning and evening) as lunch is catered onsite at the Nicholas Music Center. What meals are served to CMI participants? All students (residents and commuting students), faculty, and staff eat lunch together onsite at the Nicholas Music Center. Lunches are catered by University Dining Services. Residential and commuting students eat dinner at the Neilson Dining Hall, nearby (a short walk) to the dormitories and the Nicholas Music Center. Residential students also eat breakfast at the Neilson Dining Hall. Are meals included in tuition? Commuting student tuition includes lunch & dinner only. Residential student tuition includes all meals. Yes, meeting the needs of the Rutgers University community year-round, University Dining Services is able to accommodate most, if not all, special dietary needs. Students must indicate any dietary needs on their CampDoc profile and may also contact University Dining Services in advance of the CMI. How do I contact University Dining Services? Please contact Peggy Policastro for more information regarding dietary needs and special diet considerations. Are directions or campus maps available? View building location of the Nicholas Music Center and find directions here. Is a schedule of activities available? Yes, a sample schedule may be found here. Faculty members are selected based on their outstanding accomplishment as educators and performers, as well as their demonstrated ability to work effectively with pre-college students. We do favor past CMI faculty who we have found to be hard-working, excellent performers and teachers, and who have produced outstanding results from their CMI students over the past several years. How are students assessed to provide for proper ensemble placement in ensembles/classes? All interested students are welcome to attend this camp and will be placed into ensembles based on the quality of their sample submissions, past acceptance, and/or All-State Ensemble membership. Adjustments to ensemble membership may be made during the camp session if required. What are elective activities & how does my child sign up for them? Elective offerings allow students to spend time with professional teaching artists learning about specific musical subjects that engage their personal interests and passion. Students attend the same elective class each afternoon. Students select their elective class when they check-in for the first day of camp. We do our best to put students into their top-rated elective classes. 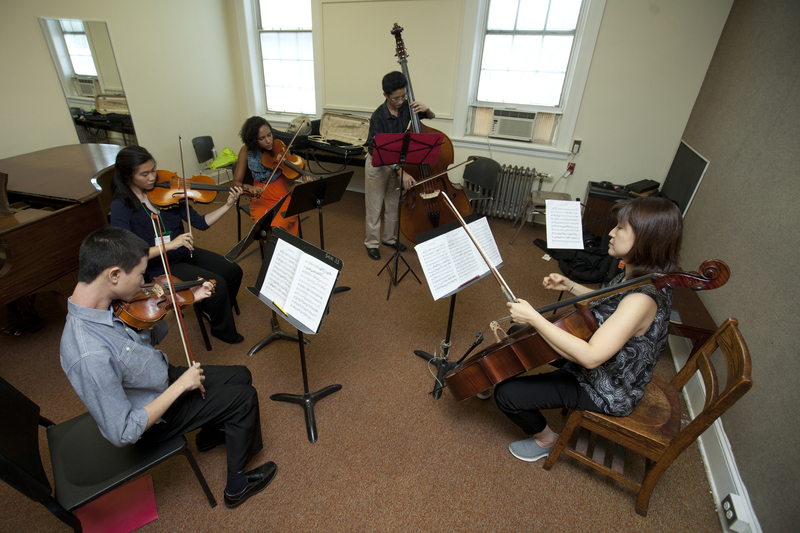 Electives change year-to-year; sample elective classes include composition, Alexander Technique, improvisation, mandolin ensemble, viola da gamba ensemble, music technology, choral music ensemble, and musicians’ health. Private instruction during the CMI can be arranged during registration on the first day of each session and costs $95 per lesson. Students will choose at that time the instructor with whom they would like to study. Payment must be made with cash or by check to Rutgers University. Private lessons can be arranged later in the week but are subject to each instructor’s availability. Students requiring assistance in learning parts or working out ensemble challenges can also get help from the CMI’s professional counselors and staff during free time, who are available to assist in aiding the student’s learning process. How do you motivate my child? Motivation comes from students who are excited to attend camp inspiring one another; faculty who are well prepared and fully engaged in their work; a repertoire that inspires developing artists; and a learning environment that is conducive to student achievement. By fostering in our students a sense of ownership in the CMI and pride in their own work, they are motivated and thus motivate others to excel. How can Mason Gross summer camps help in college preparation? Students learning from collegiate faculty and outstanding professionals engaged in successful musical careers come into contact with standards of excellence found at a premiere arts conservatory – the Mason Gross School of the Arts. Additionally, a Mason Gross Admissions officer will present a workshop on college admissions that will help students in their preparation for college. Will students have free time for activities? Yes, but not very much! Residential students have free time in the evenings. Our intention is to build an exciting, intense, impactful week of orchestral training that will inspire students for the year to come. We do plan fun social events, but our focus is on providing excellent musical experiences for our students. Please find our registration process here. Whom do I contact for assistance, or with questions? For any questions regarding the application procedure and administrative matters, please contact the Extension Division. For any questions regarding the auditions, curriculum, and student life matters, please contact Program Director Jhi-eun Gu. Get help creating a YouTube channel here. Registration is open with a July 1 deadline. Health forms are due on July 3, 2019; Applications will be considered on a case-by-case basis following the close of registration. No. We only accept registrations online. Payment is made online via our secure registration system. You will set up a username and password to access your registration account. Please complete online forms as prompted. Pay a portion of your balance due, or pay for the entire camp at once. Payment plans are available and may be set up at the time of registration. Please note: Auto billing is required of all camp participants utilizing payment plans. You may pay off your balance due at once or in stages at any time prior to the date of the final payment plan installment. Billing questions? Please contact the Mason Gross Extension Division office at extdiv.office@mgsa.rutgers.edu or 848-932-1500. You can either return to your online registration account and complete payment via credit card, in person via check or cash or by mail via check. For information regarding payment procedures and payment plans for summer programs, please visit the “Payment Procedures” section of our summer program policies page, which can be found here. No. However, The Rutgers Federal Credit Union has financing options available for continuing education and summer programs! If financing or cost is an issue, we urge you to fill out the Rutgers Federal Credit Union Continuing Education Loan application. Are there any discounts for Rutgers faculty or staff? Yes, Rutgers faculty and staff are eligible for a 10 percent discount. This discount may not be combined with other offers. Are airfare and other travel costs included in the tuition? No, participants are responsible for their own transport costs. Are recommendations for transport from area airports to campus available? Yes. here’s a list of available area transportation. Can you recommend area housing options? The Rutgers University Inn and Conference Center (walking distance to campus; free bus service to downtown New Brunswick), as well as the East Brunswick Hilton (requires transportation to campus), are both fine options. What are your policies regarding social media? Students may use social media during recreational times only. Faculty and staff are prohibited from interacting with students using social media during camp. If social media is used to bully or denigrate other participants, the student will be dealt with under our bullying policy. What are your policies regarding cell phone use? Students may use cell phones in-between instructional sessions and during instructional sessions in the event of emergency only. Cell phones must be silenced during instructional sessions. In most cases, students are informed of behavioral issues detected by camp faculty and/or staff and given the opportunity to modify their behavior while continuing in the camp. The Extension reserves the right to dismiss students without warning in cases of egregious breach of policies and/or procedures, or in cases where the safety/well-being of other campers is threatened. Parents of minors will be informed of any pending disciplinary action. A participant waiver that includes a photo release form and a waiver of liability is included in the registration process. Will my child be able to bring a laptop or other electronic device to camp? Personal computers may be used during free time. Students will be supplied with a password to connect to RU Wireless. Is it possible for my child to leave campus during the week? Yes, but only by special arrangement with the Extension Division Director, Derek Balcom. Student’s whose parent(s) have not formally notified Derek Balcom of their intention to pick up their child from campus will not be permitted to leave the building early. I have specific questions not addressed in this FAQ document. Can I speak with someone? Yes, e-mail us your name, phone number, the best time to reach you, and your question. In the subject line of your email, indicate the following your name, the name of the camp, and your question. We will contact you with the answer to your question at the next available opportunity. Call us at 848-932-1500. Please note that the best way for us to put you in touch with someone who can answer your question is to email us first and let us then contact you via phone.